Review in a Nutshell: Never Fade is the perfect sequel to The Darkest Minds. It is a must read for anyone who enjoyed the first, or even has the slightest interest in continuing the series. Never Fade begins six months after the events of The Darkest Minds. It follows Ruby as she adapts to her new life and copes with the choices she made. The pace is fast, with plenty of action scenes and witty dialogue. Alexandra Bracken’s prose is absolutely beautiful, but she also manages to throw in plenty of laugh out loud moments. She really has mastered how to get emotions out of you. I always seem to be a wreck after finishing one of her books, I swear. Bracken continues to develop the setting and shows more of what is happening in this dystopian United States. I kept wanting to learn more about this world and I was always amazed by what was revealed. After reading, I was dying for the last book to put together all the pieces of the puzzle this series has been creating. The characters are definitely what makes this book so outstanding. A few new characters are introduced in this novel, while also bringing back some of the original characters. Ruby‘s development from the first book to this one is so drastic. Sometimes I was kind of annoyed with her and how she acted but for the most part, I found her an interesting protagonist. Chubs is back in this book and still one of the best human beings. His and Ruby’s friendship is so amazing and is a great example of how friendships should be. He also adds great comic relief while being such a unique and well-developed character. I won’t talk too much about Liam, because spoilers, but I still love him as a character and honestly he really needs a hug. Poor guy. Also, there is a sad lack of Zu and I’m very upset by it. The new characters are all pretty interesting. Jude is by far the best. He adds in humor and innocence. Honestly, he is just a ray of sunshine and I want to protect him. Vida is… an interesting girl. At first, she’s really frustrating and you just want to punch her, but by page 300 I was warmed up to her, and my opinion of her only continued to get better throughout the book. Cole Stewart is another character introduced in this book. While we had heard about him before, it was interesting to see him on the page. Definitely not my favorite Stewart brother, and I wish there was more time spent on him in this book, but he’s still a compelling character and I look forward to seeing where his arc goes and as well as his relationship with Liam. 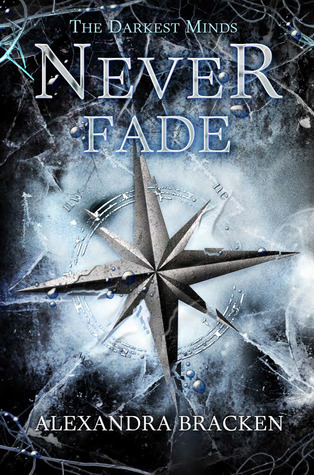 Never Fade is a fantastic, heartbreaking sequel to an amazing novel. I love the structure of your reviews!